Hundreds of people gathered on April 22 at St. Peter’s Church in New York City to celebrate the life of Lynne Stewart. They came from around the country to honor the courageous advocate for the people, who dedicated her life to the cause of freedom and justice for all. A number of descriptive adjectives are used by those who loved Lynne and admired her life’s work. She was a revolutionary, freedom fighter, friend, activist, poet, warrior, former political prisoner and speaker of truth to power. Lynne was known to all as committed, tenacious, uncompromising, sweet, precious, amazing, unflappable, tireless, fearless and radical. There were several musical presentations at the celebration, including one by Lynne’s granddaughter, Serafina Brown, and poetry readings. Messages were read from political prisoners Mumia Abu-Jamal, Leonard Peltier, Jaan Laaman and the Rev. Edward Pinkney. Former Puerto Rican political prisoners Oscar López Rivera and Dylcia Pagán sent messages, his in writing, hers an audio tribute. A highlight of the program was video and audio footage of Lynne speaking over the years. She explained that she gathered her strength from camaraderie with others and that she admired Mao, Che and John Brown, true revolutionaries who were guided by their love for the people. 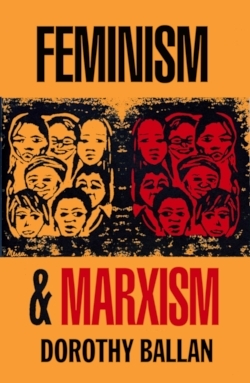 She discussed capitalist oppression, racism, militarism and state violence; grassroots organizing; and victories gained for, of and by people’s movements. Speakers referred to Lynne as the “steward” of the people. They urged support for other lawyers like Lynne. She was referred to as “a long-distance revolutionary” who defied injustice despite threats to her career and freedom. The “power of the powerless” was raised. It was stressed that the best way to honor Lynne is to continue her struggle, to fight and to win — and that we’re at our very best when we’re like Lynne. Each tribute imparted memories of Lynne, showing gratitude for the impact she had on each person’s life and explaining how she inspired them. Bittersweet memories were shared of a life well-lived. Ralph Poynter, Lynne’s spouse, was also praised for his steadfastness, strength, longtime dedication to the struggle and deep love for Lynne. Betty Davis and Lisa Davis coordinated the program; Ralph Poynter and Mimi Rosenberg were the emcees. Speakers included the Rev. Lawrence Lucas, Rikers Island chaplain; New York state Assemblymember Charles Barron; Glen Ford, Black Agenda Report; Larry Hamm, Peoples Organization for Progress; Nat Turner, poet; the Rev. Allison Moore, St. Mark’s Church; Pam Africa, International Concerned Family and Friends of Mumia Abu-Jamal; Sara Flounders, International Action Center; and Jess Sundin, grand jury resister. There were tributes by Bob Lederer, gay anti-imperialist; Cisco Torres, former political prisoner; Bob Boyle and Jill Shellow, National Lawyers Guild; Lamis Deek, Palestinian attorney; Sekou Odinga, Malcolm X Commemoration Committee and former political prisoner; and Chris Hedges, journalist. Video messages were contributed by Jeff Mackler, United National Antiwar Coalition; Ralph Schoenman, Taking Aim; Omali Yesheteli, African Peoples Socialist Party; and Clark Kissinger. A message was read from Larry Pinkney, Black Activist Writers Guild. In her early working years, Lynne was a school librarian and teacher. In the 1960s, she became actively involved in the struggle for community control of schools in oppressed communities. Growing awareness of police and judicial persecution of political activists inspired her to become a lawyer. Over the years, Lynne represented hundreds of criminal defendants, many for free. Besides working as a lawyer and street activist, she was an early supporter of the struggle for lesbian, gay, bisexual, transgender and queer rights. Throughout the 1980s, she represented many revolutionaries facing felony charges and teamed up with movement attorney William Kunstler. Lynne was a lawyer for Sheikh Omar Abdel Rahman, an Egyptian cleric who was blind. He was falsely accused by the U.S. government of participating in a “terrorist conspiracy” in New York City and was convicted in 1995. While serving a life sentence, Sheikh Rahman died in February. Lynne issued a press release on Sheikh Rahman’s behalf. As a result, she was convicted of conspiring to “aid and abet terrorism” and given a 10-year prison sentence. Imprisoned in 2009 at the age of 70, Lynne was then in remission from breast cancer. However, due to medical neglect, within three years the cancer returned and spread. Lynne won a medical “compassionate release” from Carswell Federal Medical Center on Dec. 31, 2013, with a prognosis of less than 18 months to live. A video of Lynne and Ralph produced by Flavia Fontes was played, showing the day of her joyous release from prison. Smiling, she said, “Everyone should have a Ralph.” Footage also featured Lynne’s arrival the next day at Kennedy Airport in New York City, There, she repeatedly expressed her gratitude to everyone who gave her love and support. 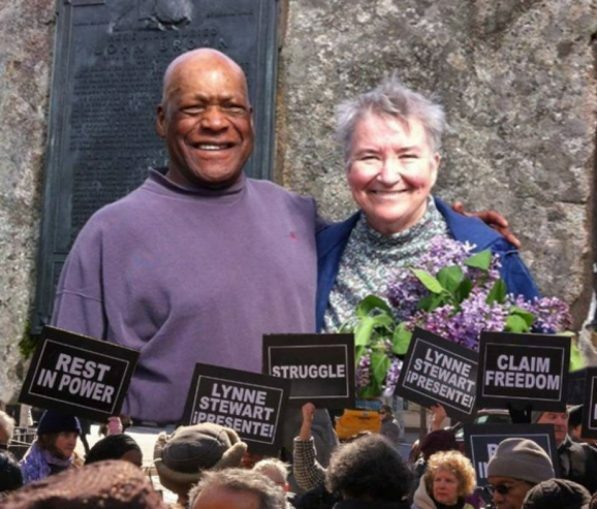 Lynne beat the odds and survived for three years in freedom, continuing her lifelong commitment to fight for all victims of the racist, capitalist injustice system. She resisted until her last breath on March 7. The slogan “Live like Lynne! Dare to struggle! Dare to win!” is true to its core. To continue her life’s work, see LynneStewart.org.